If your child is beating the heat with long days in the pool, they could end up with a nasty case of swimmer’s ear. Read on to find out the cause, symptoms, and solutions to get your tyke back to enjoying their summer ASAP. Swimmer’s ear, also called otitis externa, is an infection of the skin of the ear canal. It’s a common problem for kids, characterized by itchy, occasionally painful, and draining ear canals. It’s different from an “otitis media” ear infection, which is an infection of the middle ear space beyond the eardrum. 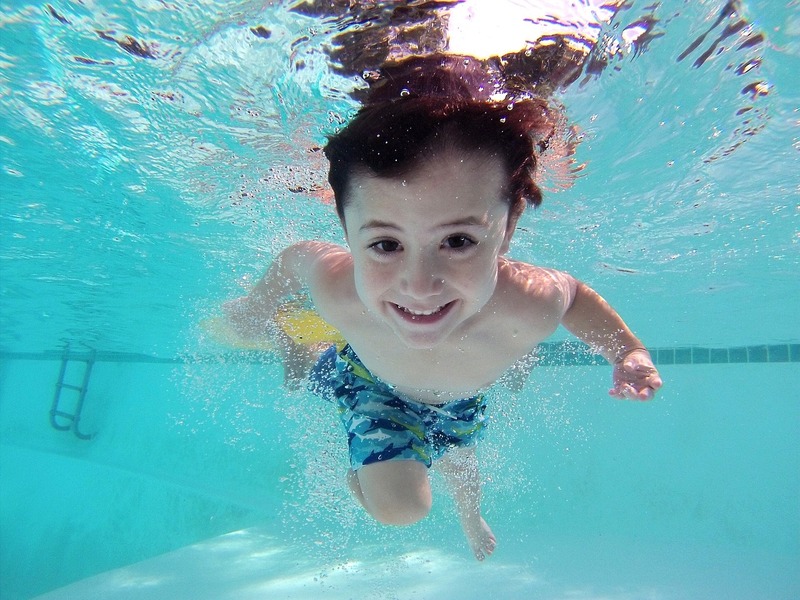 Children most prone to swimmer’s ear are those who spend lots of time in the water, such as swimmers or children who spend a great deal of time in the bathtub or hot tubs. The first sign? Your child may complain that their ears are “itchy.” You may see your child putting their fingers in the ear canals and rubbing them vigorously even before complaining of pain or itching. There may be a red irritation at the ear opening, as well. This itching is usually followed by the production of a clear discharge and then a yellow drainage. At this stage there will usually be some degree of pain involved. Frequently, there will be pain when the outer ear is gently moved up and down. Children will often complain that they cannot hear well or that sounds are muffled, because their ear canals are plugged with mucus. Yellow pus drainage in the presence of fever, pain, and irritability may also be the result of a ruptured eardrum. This distinction may be difficult without your healthcare provider’s direct examination. What do I do if my child has swimmer’s ear? Use acetaminophen or ibuprofen to relieve mild discomfort. Valerian root is a mild herbal sedative that may ease significant restlessness or pain. Valerian root may be most useful at bedtime. For dosing, follow the package labeling accurately. Willow bark extract may help an earache as a topical pain reliever. Place 2 to 3 drops in the painful ear (or both ears) and place a cotton plug in the ear canal to keep the drops from draining out. This should be repeated as often as every 2 to 4 hours. Warm the oil each time. Rescue Remedy™ is useful if your child is uncomfortable from the illness, stress, or anxiety. You may use 2 drops every 10 minutes to every few hours to calm restlessness as needed. You should check in with your healthcare provider. Your doctor can evaluate the best approach to get rid of the infection. Your child may need to use prescription ear drops with an antibiotic to kill the bacteria. If the ear is too swollen to get the eardrops in, your doctor may use a wick — or a thin sponge — to get the medicine in contact with the infection. They might also clear away pus and buildup with gentle suction to make sure the antibiotics can do their job. Most eardrop prescriptions last 7-10 days. While it can be hard to keep treatment going after your child is feeling better, doing so will make sure that the infection doesn’t come back — whether you’re using at-home remedies or prescription ear drops. If your child is prone to swimmer’s ear, a dilute solution of acetic acid or alcohol can help dry up their ear canal when used after a swim. Be sure to check with a doctor beforehand to make sure your child’s ears are in good shape to do so. You should also make sure your child drains water out of their ear canals by turning their head to the side and gently pulling the earlobe in different directions to help the water run out. Be sure to dry the opening of the ear canal. Don’t use earplugs for prevention or treatment unless recommended by your healthcare provider or an ear specialist. Earplugs may force earwax deeper into the ear canal. For the same reason, cotton swabs should not be inserted into ear canals. When can my child go swimming again? There’s no doubt your child is itching to get back in the pool as soon as they’re feeling better. However, they’ll have to wait until they’re done with treatment and the infection is gone — usually a week to ten days. Don’t worry! There are plenty of other fun activities to do in the summer sun that don’t require taking a plunge. Check out our tips here for starting your very own veggie garden. It’s a great way to bond with your child, and if they’re bouncing back from a bout of swimmer’s ear, their ears will thank you!